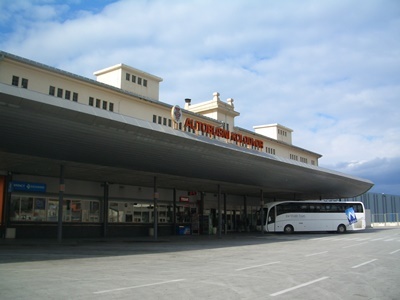 Dubrovnik bus station is situated in the western part of the city, next to cruise and ferry port. It is the departure point for all buses from Dubrovnik and the arrival point of all buses to Dubrovnik. From here you take buses to other destinations in Croatia such as Zagreb and Split as well as buses to other countries. Here you can also take buses to local destinations such as Cavtat, Peljesac or Korcula. The airport shuttle bus also departs from here. The bus station is modern and have facilities such as a tourist information centre, waiting room, luggage storage, public phones, ATM machines and exchange office, newspapers kiosk etc. Just a short walk from the bus station there is a large Konzum supermarket. On the bus station there is a taxi rank from where you can take a taxi at any time of the day and night. There is also a bus stop from where you can catch city buses to other areas of Dubrovnik. Take buses No.1A, 1B, 1C, and 3 to reach Old Town or bus No. 7 to reach Montovjerna, Lapad or Babin Kuk. Bus tickets can be purchased from the nearby kiosk. Just a short walk from the bus station you will find tourist information office (situated in the port building), restaurants, cafés, bakeries, rent-a-car offices, travel agencies, pharmacy, grocery shops, open market etc. Only 5 minutes walk from the bus station two hotels are situated: Hotel Petka and Hotel Berkeley. In the near vicinity there are numerous private accommodation facilities - guesthouses, hostels, rooms and apartments.